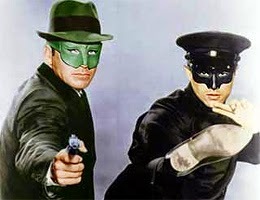 48 years ago on this date of Oct 21 in the year 1966, the seventh episode of the new TV series, The Green Hornet, aired. A wave of thefts by prominent citizens, & a car explosion which kills a psychology professor baffle police. The citizens claim to remember nothing of their heists. But The Green Hornet discovers an armored car rammed the professor's auto, and a tipster steers him to the Vale of Eden, an upscale spa. As Britt, he tours the health club, becoming suspicious that the rejuvenation method includes individualized relaxation audiotapes, and the clientèle includes some of the thieves.